Make an impression with a big, dramatic bouquet of roses, peonies, lilies, tulips and more, in radiant shades of pink and purple. It's a remarkable gift that will be remembered forever. 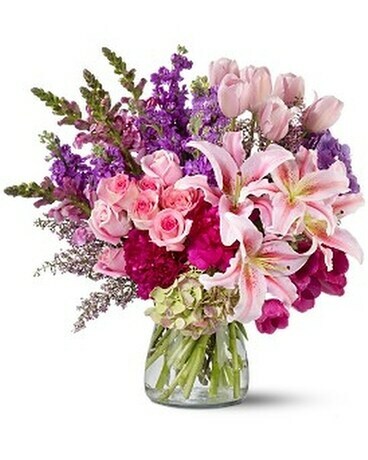 Pink roses, snapdragons, Oriental lilies and heather, hot pink peonies, light pink tulips and green hydrangea – plus purple tulips, hydrangea and stock – are delivered in a clear glass hurricane vase.